Greeting card is used as gift for all kinds of occasions such as thank you day, birthday, graduation day, wedding day, all kinds of holidays and so on. On these special occasions, people always enjoy receiving a beautiful printable greeting card. So why pay dollars for a card that sold anywhere when you can make a personalized one your own with a greeting card maker? Want to know how to make greeting cards in minutes? If you are in need of making a customized greeting card from a gorgeous greeting card template, continue reading this article. When you open Greeting Card Builder, you have two options for an easy start. If you are creative enough and have a greeting card making idea in mind, just create from a blank project. Otherwise, you can choose to be inspired from the many beautiful greeting card templates built in the greeting card maker. Click Create From Template and browse templates in the popup window. Select one you want to use and click Load and start to customize your greeting card. Besides, you can download additionally free greeting card templates by clicking the link on “Download More Templates..” In this window, you can roughly change the card size after checking in the Change Template Size option below the templates. If it can’t meet your needs after the roughly size setup, you can use the feature Page Setup to fine-tune the page margin to Left, Right, Top and Bottom. Then choose a greeting card type you want to move it forward. Here are four types – Half Fold Tall, Half Fold Wide, Quarter Fold Tall and Quarter Fold Wide. Choose Background Setup option. 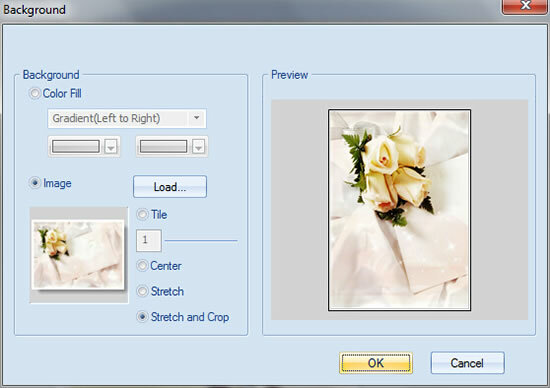 Load a pattern from the preset ones or select your own image as background. Simply, you can just choose a solider color or two different colors in gradient way to set a simple background with just colors. Switch to the panel of Add Pieces. Here you can customize your printable greeting card to a great extent by adding your own digital photos, clipart, texts, calendars and shapes. Click the corresponding button on the top left of the window to add the related embellishments you like. Relatively, switch the tabs at the right bottom of the window to select one from the abundant of preset resources. It’s very convenient with so many preset greetings in the Greeting Card Builder. You will never scratch your head for a brilliant text. Instead, you can just read these greetings and double click on the one you like to use to add it on your greeting card. It’s the same for the clipart objects and shape objects. 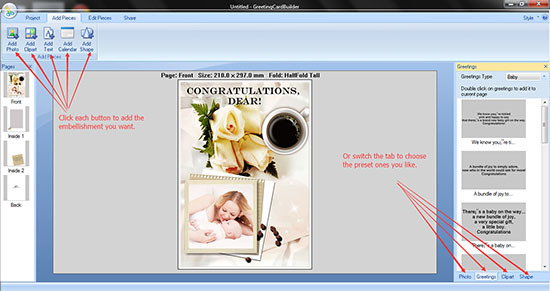 Besides, Greeting Card Builder supports dragging and dropping objects of photo, greetings, clipart and shape from the respective panels. Once you finish your Front page, design the other pages of Inside 1, Inside 2 and the Back page in the same way that you customize the Front page of your greeting card. 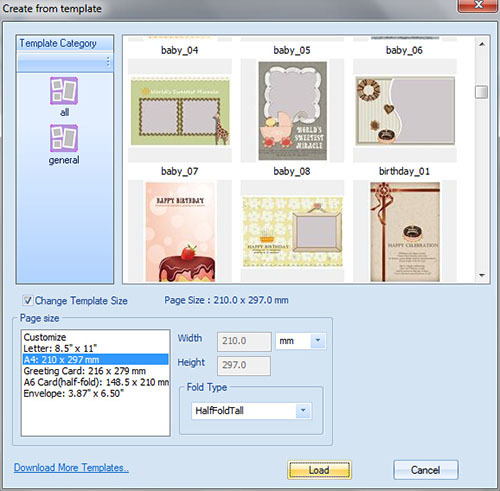 When you customized your greeting card in the greeting card maker, you can make more changes under the Edit Pieces panel. 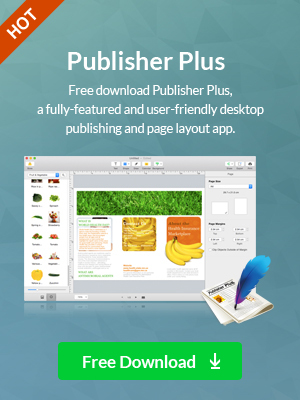 You can copy and paste any item from one page to another page. You can adjust the layer’s upper or lower at will. For photo editing features, you will see many such as crop photo, add shadow to photo, rotate photo. Just try it and explore many other photo editing features in this greeting card maker. When everything looks perfect, preview each page of your greeting card by clicking Preview button under Share panel. 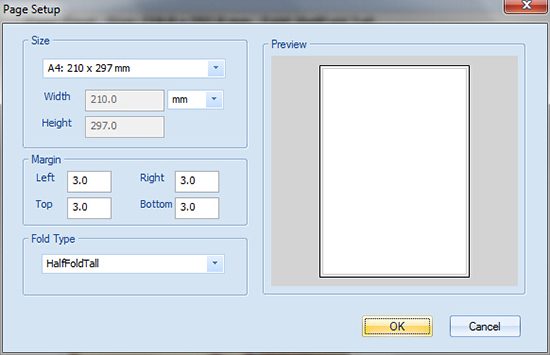 You have option to click Print Preview under Print option to preview the complete folded card. If you are satisfied with the greeting card, click Print to print the final greeting card out. Would like to make a personalized greeting card from stunning greeting card templates for any occasions with ease? Now try the easy to use greeting card make Greeting Card Builder to personalize a greeting card for holidays, birthdays, and more special occasions.